"but in the end I wound up recording this entire album with my Fractal Audio Axe-Fx II." Both Chad’s (L) and Ryan’s (R) rack setups are almost identical. For Chad, his signal goes through the Shure wireless receivers into a Radial JX44 and then splits out to the Fender Super 60 for his clean tone and a pair of Mesa/Boogie Dual Rectifers for his overdrive sound. Ryan keeps the same basic signal flow but inserts a Fractal Audio Axe-Fx II and a Line 6 Echo Pro. "A 'must own' for any guitar player! Whether you're a pro or just jamming for fun, this beast does it all! It's all over our new record. Live I use amp, cabs and effects in the box, straight to FOH and wedges. It just sounds GREAT." 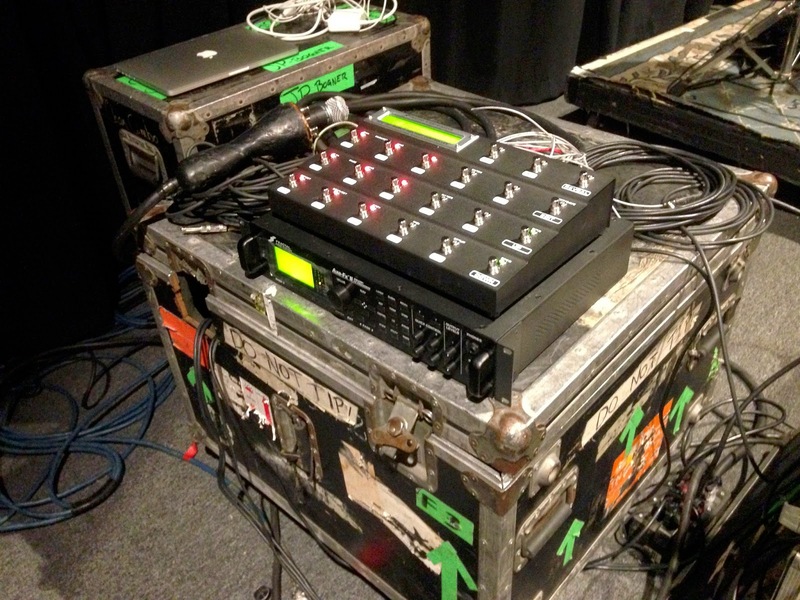 Ben used the Axe FX to record all of Dark Before Dawn, and the subsequent tours. "A Radial Twin-City Active ABY switcher splits the signal: One side heads into a Fractal Audio Axe-Fx II XL and the other feeds a Mesa/Boogie TriAxis programmable preamp and Mesa/Boogie Rectifier Stereo 2:One Hundred power amp," reads [this](http://www.premierguitar.com/articles/print/21840-rig-rundown-gwar-2014) rig rundown by Premier Guitar. The AxeFx is still, in my opinion, the best modeler on the planet for guitar tones. At the present time, there are hundreds of amps, cabinets and effects present in the firmware and at your beck and call in any configuration you can imagine. Name a classic amp, cab, or piece of gear and it's either a built in option or it's a tone that can easily be achieved. Marshall, Fender, Vox, HiWatt, Orange, Mesa, Friedman, Boss, Roland, Dunlop, etc. the list would go on for pages. Name a classic tone, artist, album, or song and it's easily matchable with the AxeFx. Besides my guitars, this is the first piece of gear I would replace if stolen or destroyed.